With the labor day, the unofficial end to the boating season fast approaching, the BoatUS Marine Insurance Division reminds boaters that boating, swimming and alcohol don’t mix. “Boating and swimming often go hand-in-hand,” says BoatUS Director of Damage Avoidance Bob Adriance, “but adding alcohol to that mix can lead to some unintended outcomes.” Charged with combing through the BoatUS Marine Insurance Claims files to identify unsafe boating behaviors and help boaters avoid injury or accidents, Adriance knows what he’s talking about. “People know not to drink and drive a boat, but they don’t always know that it’s not a good idea to drink and swim,” he added. Buried deep in the claims files, Adriance comes across a story about a group of friends having drinks at a Florida resort that decided to go for a moonlit tour of the harbor. At midnight, despite choppy seas and 20-knot winds, their boat is allowed to drift while several jump in. Unfortunately, winds quickly sweep the boat away, so the captain “backs down” on the swimmers in the water to get everyone back aboard. Amazingly, no one is hurt except for a 40-year old woman – later identified as a good swimmer – who is simply never found. Medical researchers have found that combining alcohol and swimming without taking in sufficient carbohydrates can be dangerous. In the Florida case, it is believed that the woman had only a salad and two glasses of white wine for dinner, but when adding the exercise of a midnight swim, she may have developed hypoglycemia, or low blood sugar, which causes weakness and confusion. US Coast Guard tests have shown that environmental stressors – sun, wind, wave motion, vibration and glare – can slow a boat operator’s reaction time and make them prone to more errors. This fatigue reduces an operator’s reaction time as much as drinking alcohol alone. However, when you combine the two, it can lead to boaters missing ten times as many “cues” as those who are only exposed to the environmental stressors alone. Alcohol also inhibits the body’s signaling system so that swimmers may not realize how quickly hypothermia has set in. In one case from New England, a man who was drinking beer on a sunny day fell overboard, but the cold waters quickly prevented him from climbing back aboard. He tried to swim to shore but never made it. Sudden cooling of the skin can also cause caloric labyrinthitis and/or hyperventilation. An inner ear disturbance, caloric labyrinthitis causes disorientation leading some swimmers to become confused on which way is up. Hyperventilation can also cause a swimmer to “breathe in” water. Know what drowning looks like: someone who is drowning lacks lung capacity to call for help. Drowning victims move their arms as though climbing a ladder, taking quick gulps of air before slipping back under. In an adult, this can last up to a minute before the victim never resurfaces – a child may only do this for 20 seconds. Never jump overboard before ensuring the depth of the water and knowing that it’s free of underwater hazards such as rocks, shoals, stumps, or other structures. Also pick swimming areas away from boating traffic and strong currents. It’s always best to anchor, shut down the motor, and deploy the boarding ladder before going in. In the aftermath of Irene I have been hearing many takes on the severity of the storm (or lack thereof) and how it effected the lives (or not) of people in her path. We personally came through unscathed but there are many along the Eastern seaboard that lost everything. As in most situations the reactions of people to a potential disaster depends on their perceptions and their experience in dealing with such things. However, effected or not there are things that all should still be aware of. Call 911 only for life-threatening situations. When reinstalling a TV, satellite or other antenna, check in all directions to be sure no power lines are nearby. The same goes for climbing trees to clear debris. I get all sorts of news alerts from various boating news outlets including the United States Coast Guard. As Hurricane Irene approaches, many of those alerts from the Coast Guard deal with Port conditions. Some Ports are under condition Whiskey, some X-Ray, some Yankee and others Zulu. So what do these mean? First, they are directed at commercial ocean-going vessels and represent ongoing dialogue with the Captain of the Port (COTP). They are set up as a series of escalating conditions to keep the vessels and the Ports safe. The measures taken for Whiskey and X-Ray are the same with the exception of deadlines for submitting “Remaining In Port Checklists”. The date and time that the checklists must be submitted by will be made known through Marine Safety Information Broadcasts (MSIB’s). Report Intentions to Marine Safety Office: All commercial vessels and ocean-going barges greater than 500 gross tons must advise the Captain of the Port of their intent to remain in port or depart. Closure of Departure/Arrival Windows: Ocean-going ships and barges over 500 gross tons departing the port must depart no later than 12 hours prior to the arrival of gale force winds. Cargo Operations/Bunkering: All transfer operations shall cease upon arrival of sustained 40 mph winds. Smaller Commercial Vessels Not Restricted by Draft: Smaller commercial vessels not restricted by draft, including fishing vessels, are asked to seek shelter outside the deep draft shipping channels and turning areas. Cease Cargo Operations: All transfer of cargo operations shall cease when wind speeds reach 40 mph. Vessels Desiring to Depart Port Must Arrange Immediate Departure: Movement of all vessels and barges over 500 gross tons desiring to depart the port must contact the Captain of the Port to arrange immediate departure. All Vessels Must be at Mooring Site and Follow Approved Remaining in Port Checklist:All commercial vessels and barges greater than 500 GT remaining in port must be at their mooring site in accordance with their “Remaining in Port Checklist” as approved by the Captain of the Port. Smaller Commercial Vessels Not Restricted by Draft:Smaller vessels not restricted by draft, including fishing vessels, are asked to seek shelter outside the deep draft shipping channels and turning areas. Vessels Bound for This Port: Vessels bound for this port are advised to seek an alternate destination. Within 12 hours of expected gale force winds from, the COTP will set Port Condition Zulu. Future Port Conditions are set contingent upon the storm’s course and speed. Should the hurricane increase in speed, Condition Zulu may be set sooner. All movements require Captain of the Port approval. Hurricane landfall predicted in 12Hrs. We rented a satellite phone which came in an orange, water-proof, floating box that was about the size of the largest allowed aircraft carry-on. The phone itself was heavy, had a funky looking antenna and was about the size of the WWII field radios seen in almost every war flick on the big screen or TV. The service was spotty, if existent at all, and the clarity of the signal back to the US sounded pretty much like two cans connected by a string. Alas, things have changed! An inexpensive satellite communicator that isn’t even on the market yet is earning awards and turning heads in the USA and will soon be available online. The Iridium-based inReach, a small unit that will send and receive text messages has just won major awards from both Outside Magazine and GearJunkie.com. Aimed at the trekking market, it could be very applicable for any sailor going out of reach of mobile phone coverage. Receiving is the big breakthrough. inReach is compact, lightweight, waterproof, floatable, and impact-resistant, and it can maintain satellite signal lock even in difficult GPS environments. It will be available from October on in the USA, but will be available anywhere in the world by purchase online. The unit is about the size of a typical computer mouse and weighs less than 8 ounces. The inReach offers users a number of unique advantages compared to other satellite communicators. Because it relies on the market-leading Iridium satellite network, inReach can deliver two-way text messaging with full-pole-to-pole global coverage and message delivery confirmation. It also provides remote tracking. When paired with either an Android smart phone or a DeLorme Earthmate PN-60w handheld GPS, the inReach lets users send and receive 160-character messages to and from family and friends. Messages can also be posted to Facebook and Twitter. In case of emergency, inReach users can send messages describing their situation so that responders can come prepared. The inReach can also be used as a solo device to send pre-loaded text messages or SOS alerts with delivery confirmation. Solo users can also enable remote tracking. inReach models will be widely available at retail in the U.S. and Canada and from online resellers beginning in October 2011, with a recommended retail price of $249.95, with annual subscription plans starting at $9.95 per month. For more information, visit www.delorme.com/inreach. The Coast Guard urges mariners and residents to begin planning and preparing for Hurricane Irene. Stay informed: The public should monitor the progress and strength of the storm through newspapers, the Internet, and local television and radio stations. Boaters can monitor its progress on VHF-FM channel 16. Small craft advisories and warnings are also available on VHF-FM channel 16. Evacuate as necessary: Mandatory evacuation orders should be obeyed. Coast Guard personnel and other emergency responders may not be able to evacuate people in danger during a storm. Secure your boats and boating equipment: Owners of large boats are urged to move their vessels to inland marinas where they will be less likely to break free of their moorings or to be otherwise damaged. Boats that can be trailered should be pulled from the water and stored in a place that is not prone to flooding. Those mariners who leave their boats in the water are reminded to secure life rings, life jackets and fenders. Mariners are reminded that drawbridges along the coast may deviate from normal operating procedures prior to a storm. They are generally authorized to remain closed up to eight hours prior to the approach of gale force winds of 32 mph or greater and whenever an evacuation is ordered. Because of the uncertainty of weather movements and related bridge closures, mariners should seek early passage through drawbridges well in advance of the arrival of gale force winds. The headline above seems to imply that it was the boat that was “drunken” and at fault. Fortunately or unfortunately that was not the case. The boat’s driver, a 23 year old male, was treated for minor injuries after the 2:40 a.m. crash. His three passengers, all men in their early 20s, were not hurt. We keep going over this and over this and apparently the word is still not getting out. All readers that follow this blog please help spread the road. This is no way to control population growth. “Boat on the Rocks” is not a fancy drink. Notice that he either didn’t see the large lighted marker at the end of the breakwater, or chose to go on the wrong side. Perhaps a little brush up on aides to navigation would be in order. 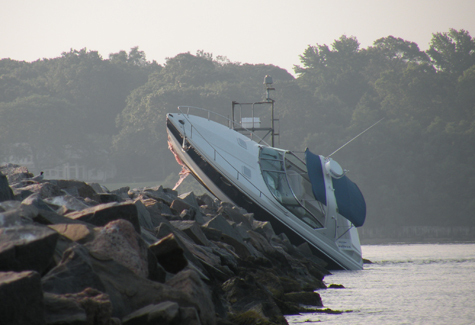 Two local companies combined last Saturday to remove the 26-foot boat left stranded atop the breakwater after the driver, who was later charged with boating while intoxicated, ran the boat completely up out of the water. The Bee Gee’s were singing the need for Stayin’ Alive back in 1977. Since then the theme has made its way into the marine market. The following product has been out for a short while but this is my first exposure to it. I must say that I have not tested the gear and do not endorse it “yet.” It looks very intriguing and since it is USCG approved it would be legal to be carried as a required PFD and apparently visual distress signals as well. Although the video below sorta turns into an “infomercial” at the end. I still think the idea is a great one. Ingenuity is still alive. The StayAlive Life Jacket is an advanced Marine Survival System approved by the US and Canadian Coast Guard. For many years, boaters’ have used life jackets to simply keep themselves afloat. StayAlive is the next generation in marine survival, using a panel system, to carry eleven water survival tools. StayAlive contains almost all the required safety gear mandated by law in one safe, accessible unit. Add your fire extinguisher, type 4 throwable (if required) and you have all your safety gear for the US and Canada. or visit the informational website.